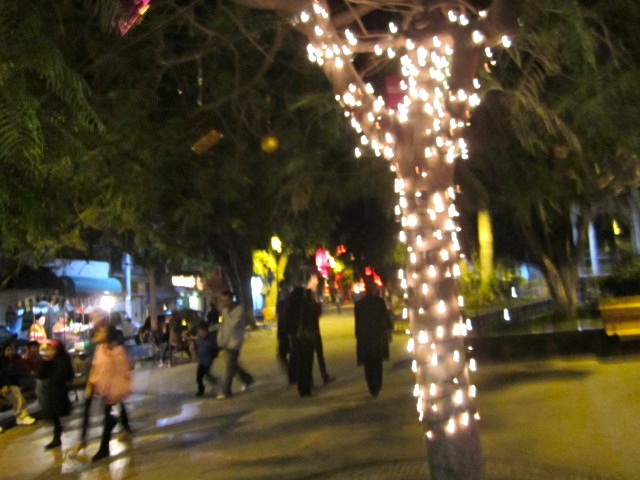 Christmas in Mexico lasts for many days. 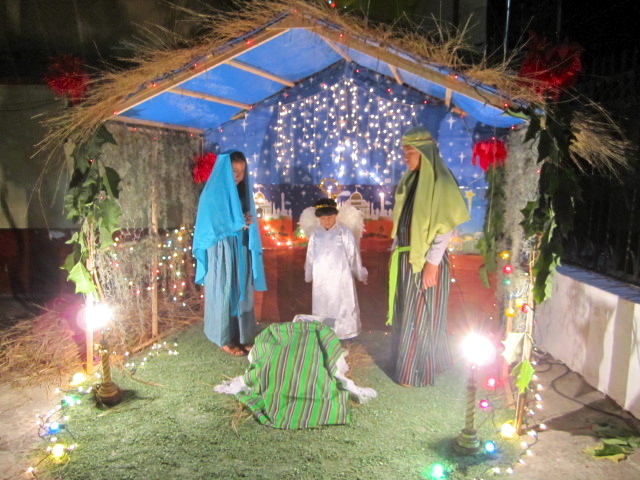 Las Posadas start on Dec. 16th and end on Dec. 24, Noche Buena. 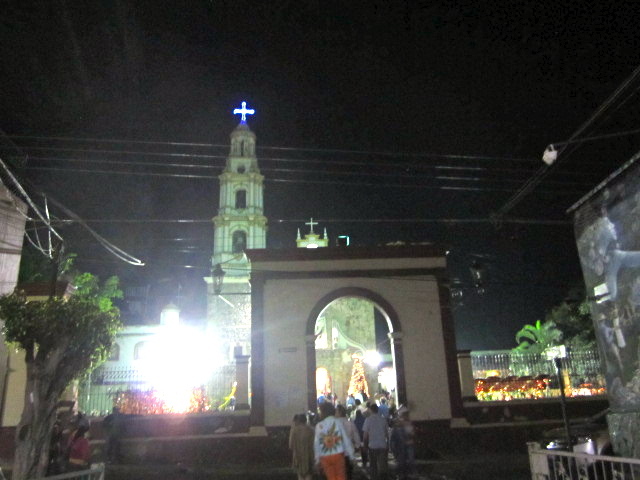 During those nine days, people are setting off cohetes (Fireworks) and church bells ring often. It is very noisy in Mexico during this time of the year. 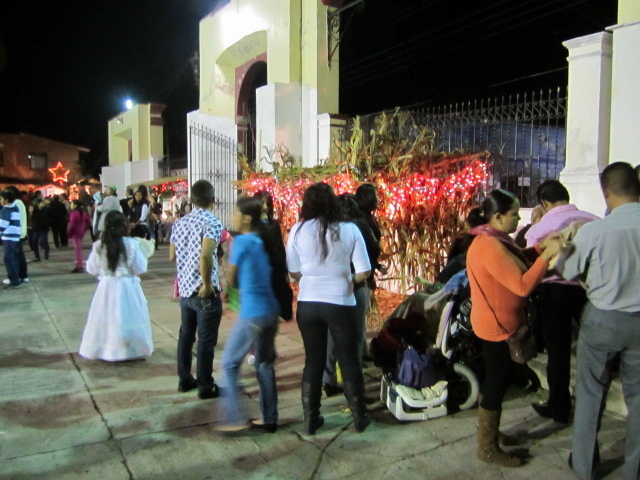 Las Posadas are parades of different groups of people walking down the streets. They are from various neighborhoods or sometimes they are specific kinds of workers, like carpenters or fishermen. People carry candles and statues. The statues may be of Mary, Jesus and/or saints. The people sing Christmas songs and sometimes stop for prayer or religious readings during their walk. 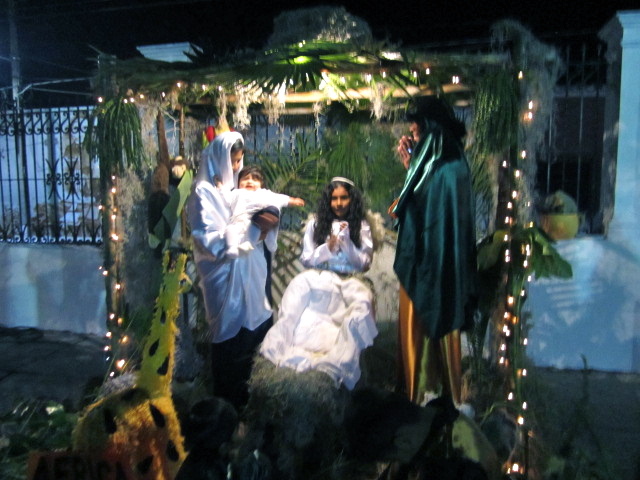 The parade is symbolic of Mary and Joseph looking for a place to spend the night, knocking on doors and being turned away. Finally, the parade ends up at a house where they are welcomed. There is food and drink. The drink is usually a traditional punch of sugar cane, prunes, guava and cinnamon sticks. They are also served little round fruit cakes called Tejocotes. Also, every evening during this time there are the traditional breaking of the pinatas. The children love doing this. Each person gets a bag filled with nuts, fruits and candy. On the last night a special doll that represents the baby Jesus is placed in the crib in the nativity scene and people sing lullabies to it. 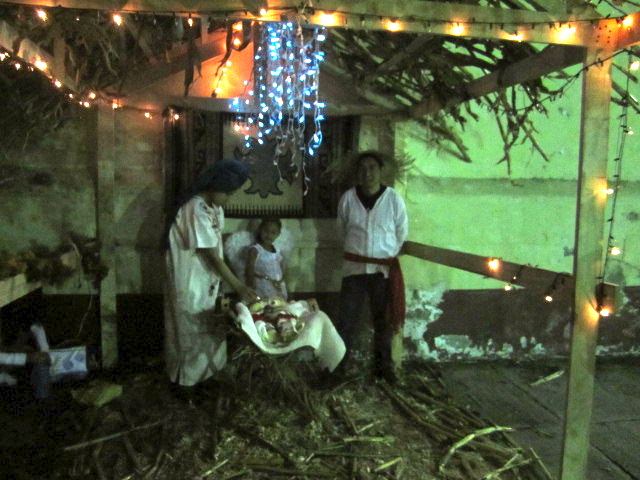 One woman takes the doll home after the celebration and takes care of it throughout the year. Some people believe it has special powers. 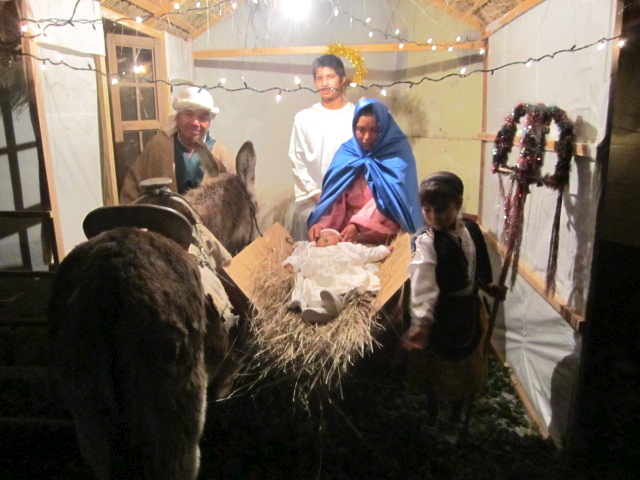 So if you see nativity scenes in Mexico, you will not see the baby Jesus in the crib until Christmas Eve. On February 2nd called Dia de La Candeleria, (Candle mass day in English) this doll is taken to church for a special blessing by the priest. People pay money to have the doll dressed in special clothes. Sometimes a lot of money. 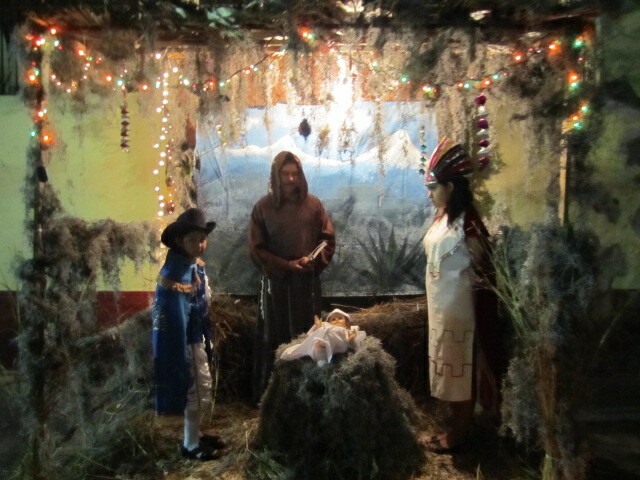 The photo above is of a Creche that was at the church. It is the only one there that night that consisted of statues. The rest of them had live people in them. So, I am assuming that this is the one belonging to the church and the baby Jesus in it is going to be taken home by a loving woman for the next year. February 2nd, in the Jewish tradition, represents the number of days after the woman gives birth. Those are days of purification for her and on the last day, Feb. 2nd. the baby is presented at the temple. The woman in the above photo had her newborn baby in her lap. What an inspiration that was for me to see so much love from her. It represented the true spirit of Christmas. I am glad it was a fairly warm night for the Creches. We were at the church early in the evening and not many people had arrived yet. It gave me a better chance to take photos of the Creches. Each one represented a different country and time. I couldn’t figure out some of them but I enjoyed them all. My friend told me that each year the theme changes. One year she said there were Creches from other worlds. That must have been fun. One from Saturn, etc. I liked the live donkey in the above photo. 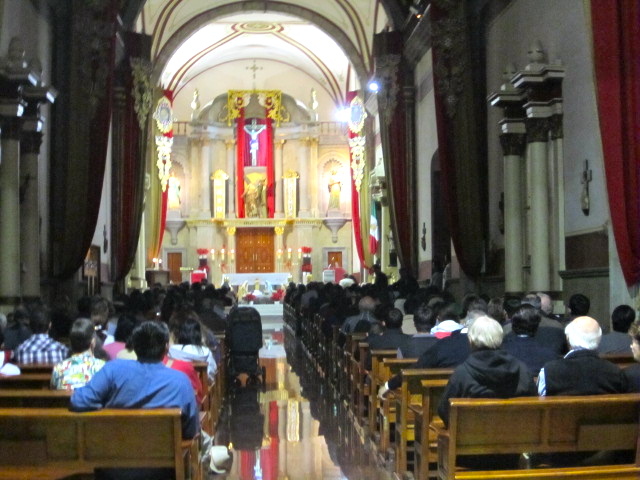 Of course, there was midnight mass on Christmas Eve. I am sure that was crowded but I didn’t stay that long. I was able to recognize the above Creche. American Indians. They didn’t have a live baby. It must be very special for families when they have babies just before Christmas so they can include them in the Creches. 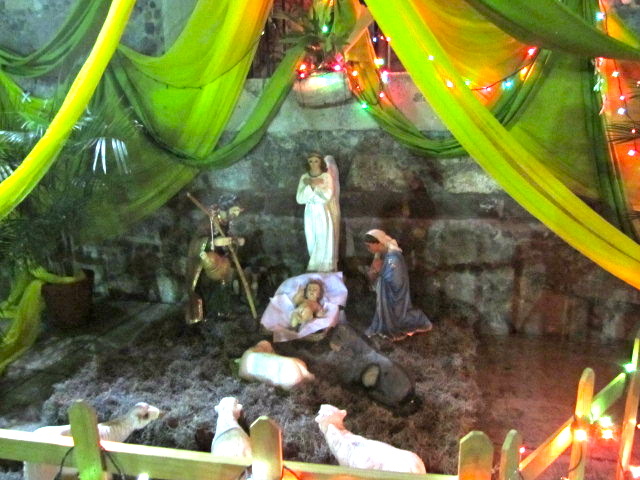 The baby in the Creche above was getting irritated with the situation. 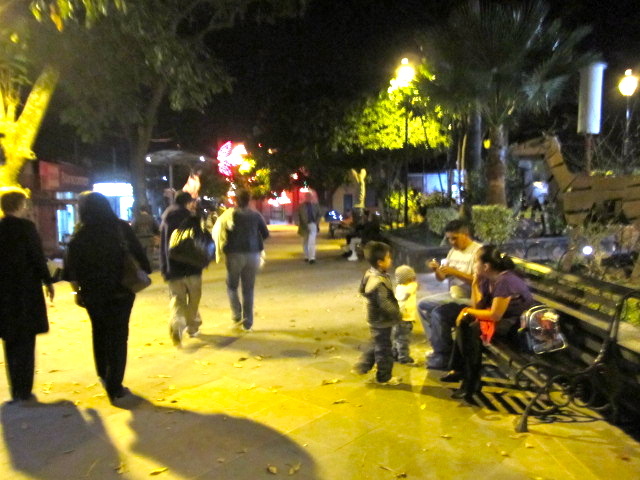 Families here are so loving with their babies and children. It is always a pleasure to see that. 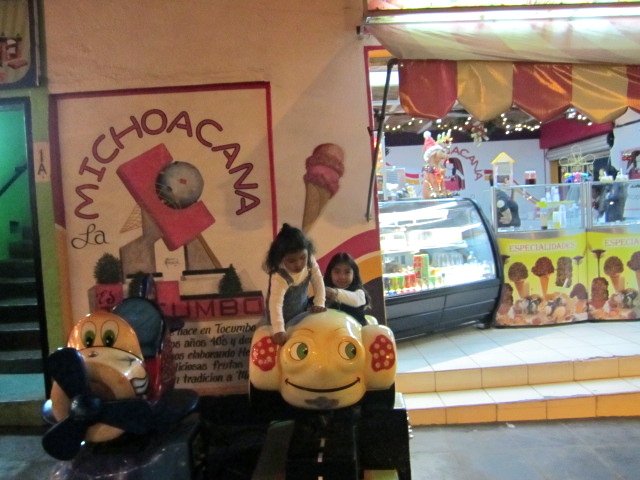 After viewing the Creches, I walked on with my friends to the plaza. It was too early there for many people. Again I was glad not to be in a crowd. 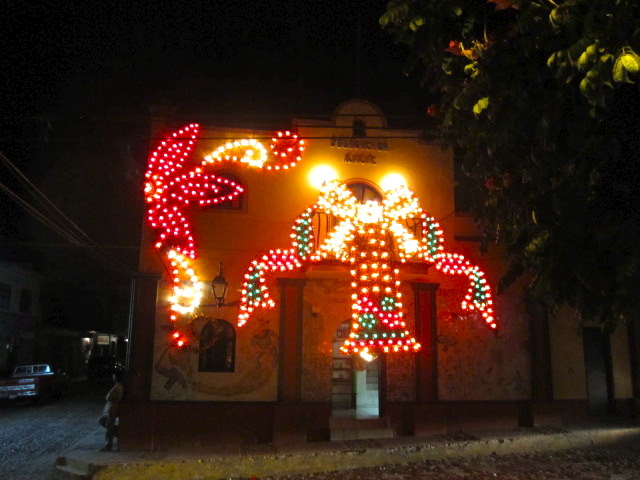 But to continue with the Mexican Christmas traditions….. After midnight mass, they go home and have a traditional Christmas meal. 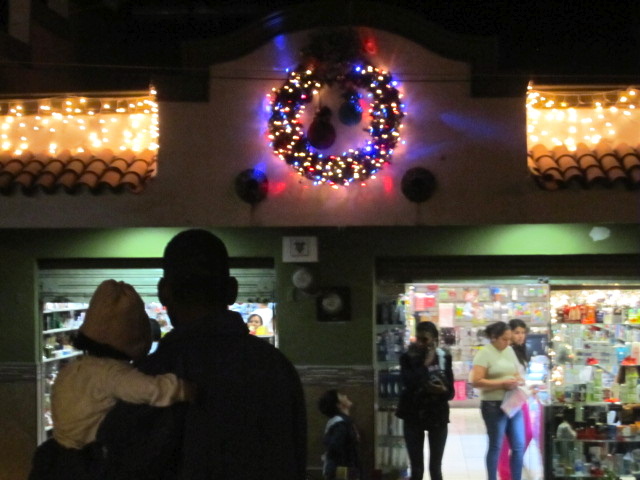 Christmas Eve is the main holiday in Mexico, not Christmas Day. Children don’t open their presents until January 6th which is called Three Kings Day, or Epiphany. On that day a ring cake is shared with family and friends. A miniature plastic doll is inserted in it when it is baked. Everyone cuts his or her own piece of cake and whoever gets the doll buys tamales for everyone on February 2nd which is yet another holiday. 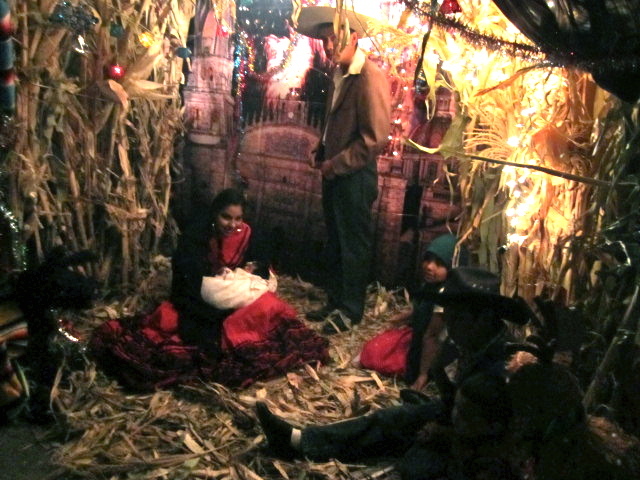 Sometimes people makes jokes with this tradition, hiding the dolls so they don’t have to buy the food. 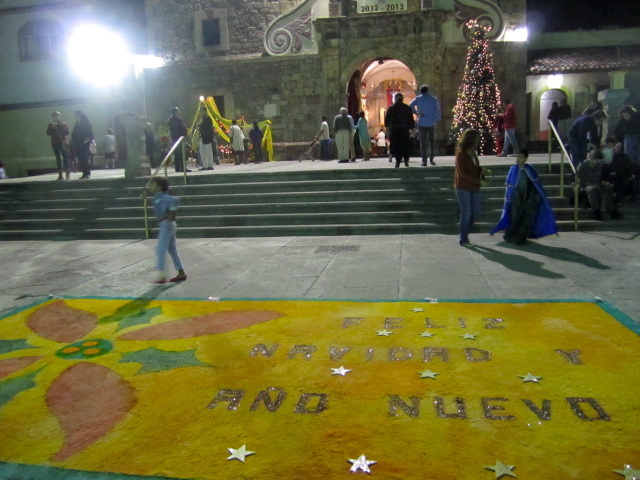 So the Christmas season lasts a long time here in Mexico; pinatas and parades, loud bangs, church bells and many traditions. It isn’t focused as much on buying and giving gifts as it is in the States. Toys are very expensive here. An electronic game might cost more than a month’s salary for a Mexican worker. A simple stuffed animal that sells for a a few dollars in the States may cost twenty dollars here, which is more than a day’s wage for many Mexicans. There were some lights in the plaza, especially on the building above. Electricity is another thing that isn’t cheap here. People don’t spend a lot of money on electric Christmas lights and statues. Things are much simpler here. 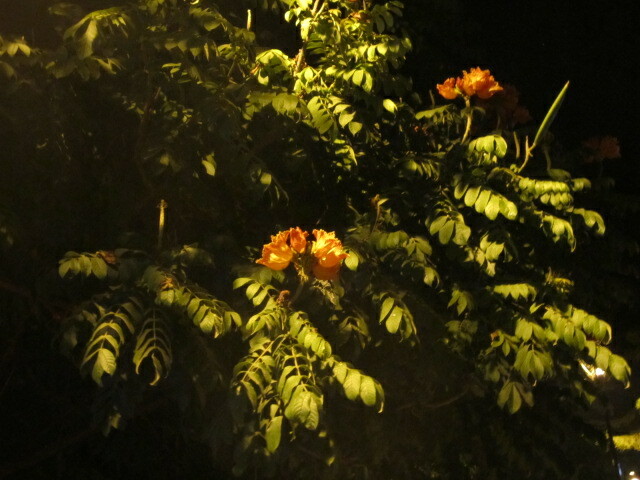 I loved seeing the flowers in the trees lit up from the street lights. 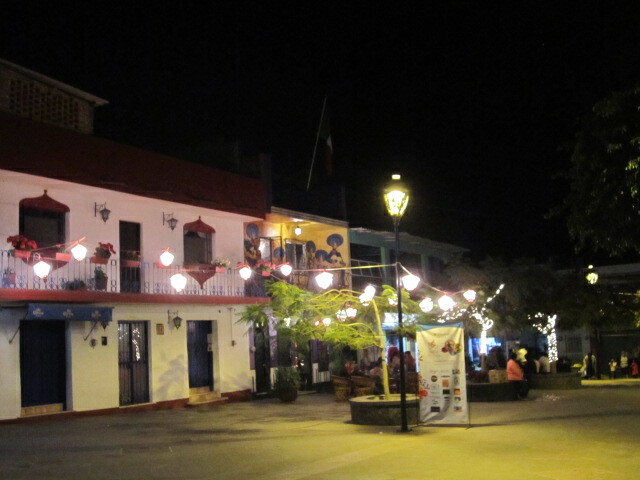 The photo above shows the major lights in the plaza, a couple of trees and lanterns hanging from them. 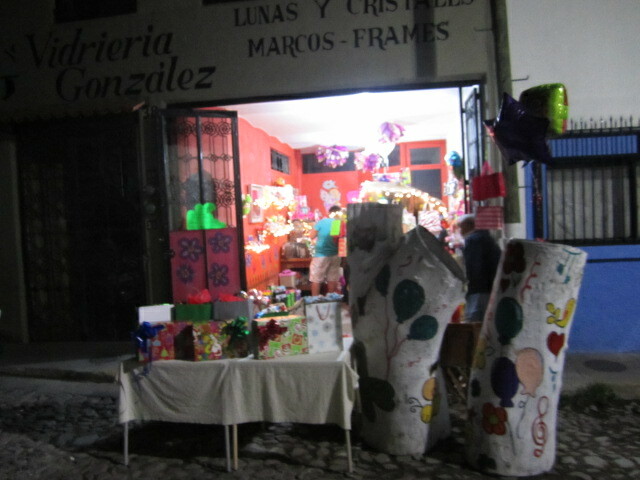 Above is a photo of a small store that stayed open for Christmas Eve. Christmas is my favorite time of the year here. If you have never been to Mexico during Christmas, please come. It may change your life and the way you see the world. How is the plaza, it must be finished by now?